Waste Management specialists, Powerday, has become one of the first to incorporate voice search on its website thanks to the cutting-edge work of digital marketing agency Adtrak. London-based operation worked closely with Adtrak – one of the largest digital agencies in the UK and an expert in providing digital marketing solutions– to modernise and enhance its online customer experience. The agency implemented new software, which allows the customer to ask questions via the FAQs page, or use the search box option, all using voice recognition tools similar to Amazon Alexa and Google Home devices. Voice capability has also been introduced on the contact page, with the aim of reducing the time users spend manually typing out their contact details. John Cutts, Senior Internet Marketing Consultant at Adtrak, headed up the voice trial for Powerday and is already seeing a number of users interact with it. 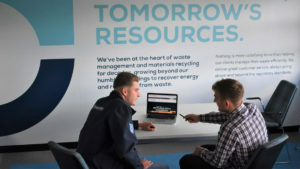 The investment in technology comes at a time when many companies, including Powerday which specialises in waste management and skip hire services, are recognising the benefits of voice search and recognition to future-proof their business. More than 40% of adults now use this technology at least once a day and 20% of all Google searches are voiced. To put this in perspective, this means 700 million Google searches are done by voice and there is speculation that traditional digital marketing practices such as Search Engine Optimisation (SEO) and PPC (Pay Per Click), will need to adapt to remain relevant within the industry. By investing now, Powerday is positioning themselves ahead of the industry, whilst also providing an enhanced customer experience for the growing number of people wanting to use voice recognition.